Blades and hardware can be purchased separately, or bought together as a complete kit (you supply only the wood for the frame) for a modest savings. Hardware: The hardware comes in a small and large version. The small works with only the smallest blade, the large with the two larger blades. All parts are made from steel, and are sized to generate and withstand the considerable tension that makes these saws function well. Ready to install, with the exception of the steel brackets, which have a small welded seam on the inside that should be filed down. This is a few minutes of work with a coarse file. One heavy duty (lift rated) eye bolt. One bearing plate (with two wood screws). Two keepers (for holding the blade in the brackets). For further details on the hardware, please visit the Roubo frame saw hardware page. Blade: Available in three sizes (see table below), with custom lengths of up to 50" available. Blades are bright steel; this is not a fine polish or mirror finish, but is perfectly serviceable. They can be used as they come, or sanded to a more polished finish before sharpening. Because these saws are meant to cut fast, the teeth are approximately 0° of rake unless otherwise requested. Blades can be ordered unsharpened or sharpened. Unsharpened blades need to be jointed, sharpened, and set. Taper triangular saw files for sharpening the teeth are available here. Sharpened blades are jointed, set, and sharpened to my high standards, and are ready to cut (they may require side dressing to fine tune the tracking, which is explained in the sharpening instructions). Premium 1095 spring steel, hardened and tempered to Rc 48-51. Blades are NOT taper ground. Blades feature an untoothed section at the front of the blade for easy and accurate starts. Blades are available either undrilled or drilled to fit my hardware. For further information on the blades, please visit the Roubo frame saw blade page. Hardware & blade kit: Available in three sizes (see table below), this kit combines the blade and the hardware for everything (except the wood) needed to build the best frame saw on the market today. Lumber for wood frame: Wood is not included. Many species of wood will work, although woods with high bending strengths are preferred for the arms. I favor ash, but hickory, cherry, soft maple, poplar, and many others will work well. See the dimensioned templates for the hardware you are using (small or large) for the required dimensions of the wood stock. 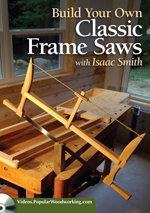 Build resources: Links to plans and notes (small | large) and instructions for tuning and use are freely available for your use; if you'd like a little more guidance, consider the video below, Build Your Own Classic Frame Saws, which I shot with Popular Woodworking. *Cutting range is, of course, only an approximation. When in doubt, choose the larger blade; you will seldom regret the increased speed and capacity. 2" x 32" x 0.032"
3" x 36" x 0.042"
4" x 48" x 0.042"
Notes on ordering blades: Because these blades are semi-custom items, please allow three to four weeks for delivery. If you need yours sooner than that, let me know and I will do my best to accomodate your request. The base configuration for these frame saw blades is unsharpened and undrilled; the teeth are punched, but will need to be jointed, set, and sharpened, and the blade drilled for the hardware before use. If you order sharpened blades, I will set the teeth for use in dry woods. If you will be working primarily in green woods, please include a note with your order so that I can add a little extra set to prevent binding. If you order drilled blades for use with your own hardware, please email a sketch that shows hole location(s) and diameters to isaac@blackburntools.com after ordering. If you will sharpen the blade and/or drill the holes yourself, saw files and carbide drill bits for doing so are available. Blades will be shipped flat whenever possible; however, due to postal restrictions on package lengths, blades over 36" shipped to certain countries will be coiled. Shipping within the US and select other countries will be calculated during checkout. For shipping charges to other countries, please contact me before ordering. Includes the brackets, eye bolt, bearing plate (and screws), and keepers. Blade and wood for frame is NOT included. See hardware section above for further details. See blade section above for further details. Please also read notes on ordering blades above. Includes the hardware (brackets, eye bolt, bearing plate and screws, and keepers as shown above) and the blade (drilled to fit my hardware). Wood for frame is NOT included. See hardware and blade kit section above for further details. Please also read notes on ordering blades above. A step by step guide to building two frames saws; the first, a Roubo style frame saw as shown on this page, and the second, a Danish style frame saw. Tuning and use of the saws is also briefly covered. Mike Siemsen's Roubo frame saw build: Mike chronicled his saw build on his School of Woodworking blog. Roubo frame saw build lesson: Shannon Rogers of The Hand Tool School offers a Roubo frame saw build lesson as part of his curriculum. Many thanks to Shannon Rogers of The Hand Tool School for this video of his Roubo frame saw in action.